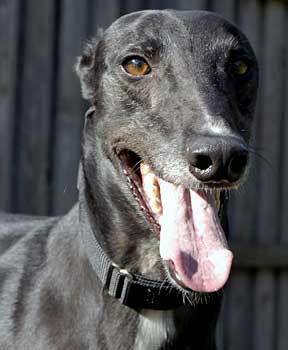 Harry, aka CTW Hot Blooded, is an outgoing, four-year-old black male. 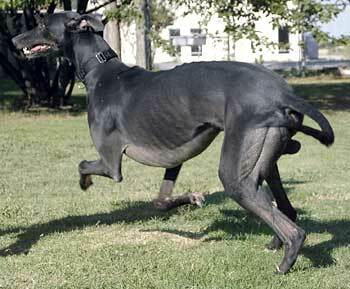 Born on May 23, 2002 to sire, Greys Statesman and dam, Ramie, Harry is a relative of GALT alumnae members Rod and Ramie. 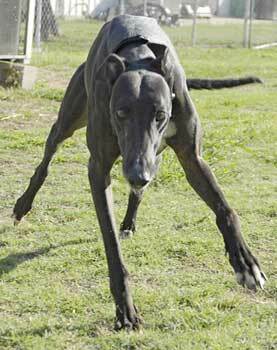 Harry was a Texas racer, competing in a total of 160 races between Gulf Greyhound Park, Valley Race Park and the Corpus Christi track where he achieved his Grade AA status. It appears that Harry's New Year's resolution was for a new career as his ranking started to slip in January of 2006, and by July he had retired. Harry is now ready to meet his new family and settle into the comforts of home life. It is not known at this time if he is small animal or cat tolerant.